Russia conducted a unique operation on June 11-12 in 1999 which entered history as The Pristina Dash. A group of Russian peacemakers deployed in Bosnia and Herzegovina entered Pristina’s Airport, Kosovo’s capital, to NATO’s surprise. The local Serbs welcomed Russian commandoes as liberators. The operation was conducted before the signing of the so-called Kumanovo agreements on June 9, 1999, which put an end to the bombing of Yugoslavia. The Serbian troops and police pulled out from the region and were replaced with international peacemaking forces. That was the time when the West launched the process to separate Kosovo from Serbia to subsequently recognize the independence of the territory. It is worthy of note that Viktor Chernomyrdin, Russia’s presidential envoy for Balkans, was among those who wanted Yugoslavian President Slobodan Milosevic sign the documents in Kumanovo. Many estimated that as Russia’s betrayal of the brotherly Serbia. As soon as the Kumanovo papers were signed, the Russian troops were ordered to move from Bosnia to Kosovo to arrive there before NATO troops. Russia obtained serious trump cards once the Pristina Airport had been captured. Russia could have claimed a special sector of responsibility in Kosovo which would have been controlled by the Russian military. However, then-President Boris Yeltsin failed to succeed at the G8 meeting on June 18-22, 1999. As a result, Kosovo was divided into the American, the British, the French, the German and the Italian areas of responsibility. The Russian contingent was deployed in other countries’ areas – presumably in the Albanian-populated districts. The Serbian police were not allowed to return to the region: there was no one to protect the Serbs. Over 200,000 Serbs and other non-Albanians left the region during the recent decade. Pravda.Ru interviewed Colonel-General Leonid Ivashov, Russia’s defense minister in 1996-2001, who took a direct participation in the above-mentioned operation to seize the airport of Pristina. “The operation was conducted in strict correspondence with international norms. It did not violate Resolution 1244 of the UN Security Council. Russia used the right because NATO did not want to make any concessions to us. “Why wasn’t the operation used to defend the interests of Russia and Serbia?" “The Americans did not want to make any concessions to us. They thought of themselves as the winners. They could only offer us a submissive role. The command of the alliance did not even want to hear anything about the Russian sector of responsibility. They offered us to become subordinated to a US general. That was the last thing that Russia wanted. We decided to make them respect Russia’s opinion. “No, we were not going to do that. 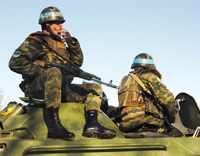 Russia played a positive role after the troops landed in Pristina. We defended the local Serbian population against the Albanian guerrillas, we defended the local temples and provided medical assistance to people. The battalion executed it goals perfectly. The future was solved by politicians.